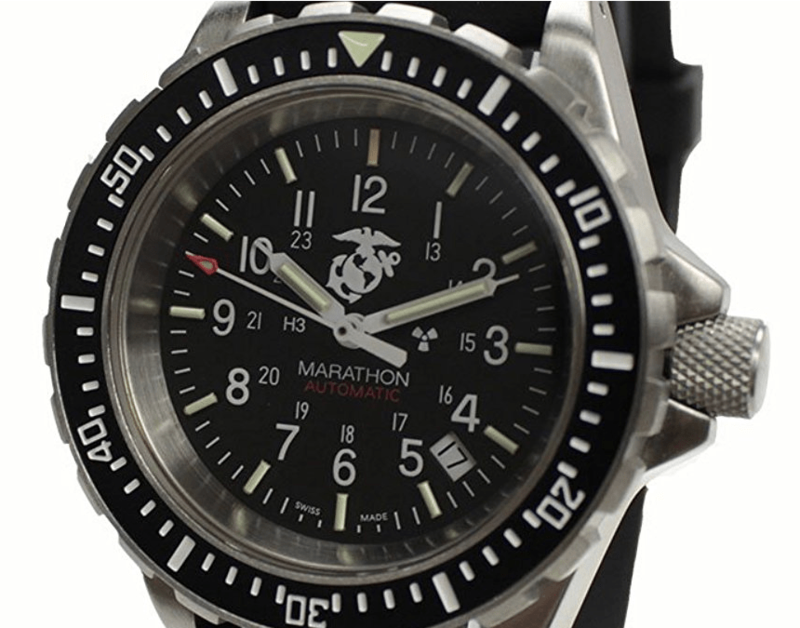 The Marathon WW194006 USMC commonly known as the Marathon GSAR (Government Search and Rescue) military watch. This is a high quality, purpose built military watch. 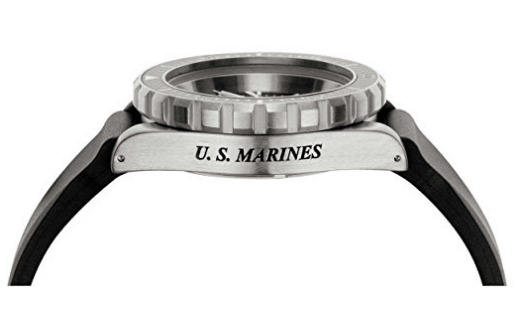 It's designed for use on Search and Rescue (SAR) missions by divers and issued to the United States Marine Corps. If you're looking for a tough watch, then this is it! In this review, we look at the Swiss movement, Tritium illumination, the GSAR's specifications, and what ISO 6425 means. 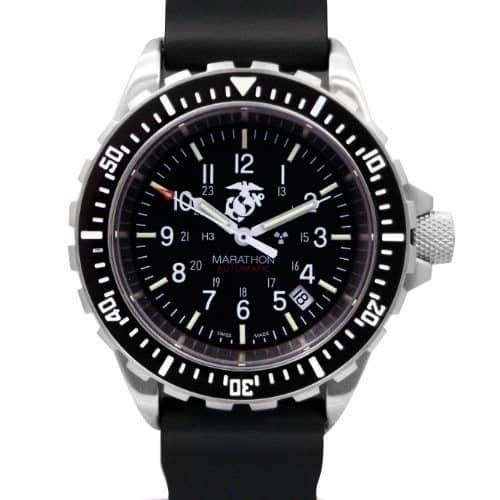 If you already know the Marathon GSAR Military Divers Watch is for you, click the button to see the current price and any discounts that may apply. Marathon Military WW194006 - At a Glance! What’s the Marathon WW194006’s dimensions and overall look? What does ISO 6425 mean for the Bezel and Crown? 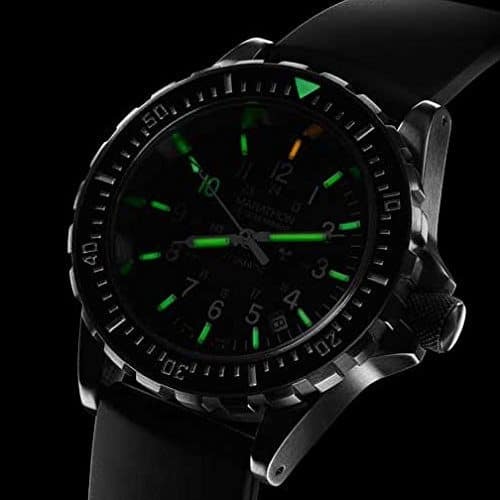 Are watches with Tritium illumination safe? 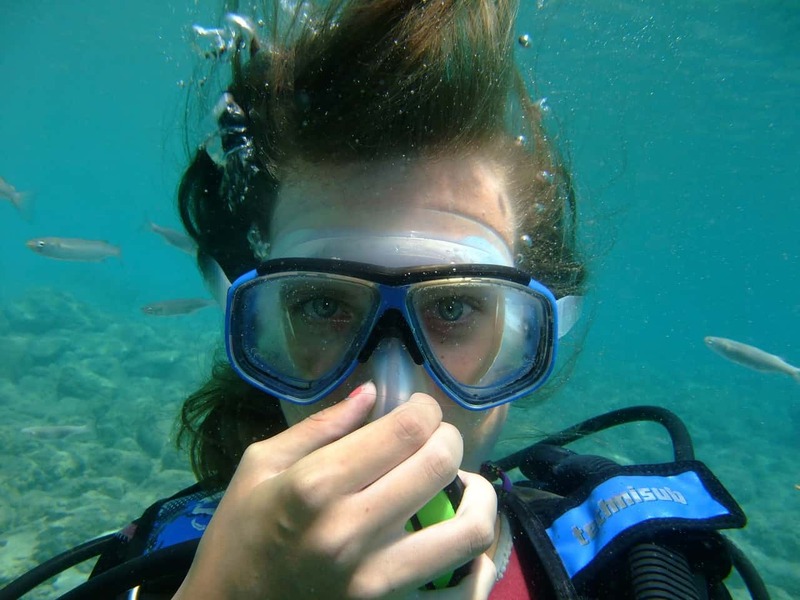 A SCUBA Rubber Band or Stainless Steel Bracelet? Marathon WW194006 – What’s the Conclusion? The WW194006 GSAR Diver’s Automatic is swiss made and built from 316L surgical grade stainless steel. This watch is certified to ISO 6425 standards and is designed to withstand extreme conditions. It is water resistant to 30 ATM (300 meters or 1000 feet) making these rugged watches ideal for scuba diving, and any other outdoor activity or water sport you want to throw at it. These divers watches are made to the highest level of quality and accuracy in manufacturing, in La Chaux de Fonds, Switzerland. 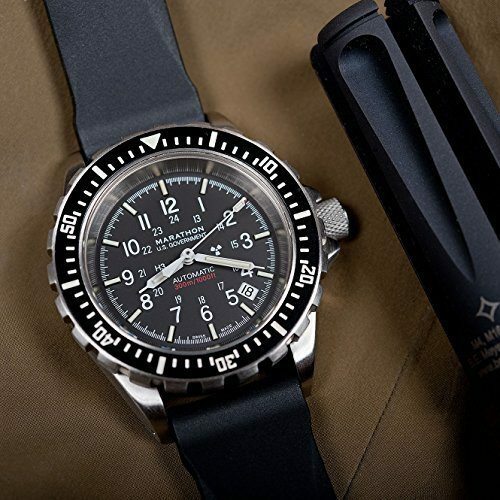 Both the dial and the second hand sweep on the Marathon Divers GSAR are easy to read. As with all military style watches, the face of this watch is matte black. The Marathon has an anti-reflective sapphire glass crystal cover. This is the most expensive and durable crystal which also makes the dial easy to read even in direct sunlight or when under water. In keeping with most military style watches, the Marathon WW194006 Automatic has a 24-hour format. It has large easy-to-read 1-12 numbers with smaller 13-24 numbers on the inner dial. The WW194006 GSAR has a date of the month display situated between the 4’ o’clock and the 5 o’clock position. The brushed stainless steel case is round in shape and is 41mm across.When including the bezel, the diameter is 42mm. The thickness is 14mm. If you’re used to bigger watches, then take a look at the Marathon WW194021 which is very similar, although slightly larger at 47mm across the face. The back of the case is screw-in, and has the NSN Nato Stock Number 6645-21-558-0133 engraved on it. This watch uses the Swiss made ETA 2824-2 movement. This movement is not an uncommon movement, but it is more expensive than most. This movement is also used in watches made by Tag Heuer, IWC, Hamilton, Breitling, Longines, and others. The ETA 2824-2 is a very accurate and reliable time keeping movement and runs within the standards that are acceptable for automatic movements. It will run to within +/- 30 seconds per day. It may pay to sync it once a week. Automatic watches can take a few weeks to settle in before they hit their stride. Make sure you give this watch a few weeks to settle after purchasing. The wait is well worth it. This is a very robust watch that will give you many years of good service. If you're really adamant about accuracy, a jeweler might be able to fine tune it. If you need more accuracy, then have a look at the less expensive quartz version. It is the same watch but with a more accurate quartz movement. Click here to have a look at the Marathon WW194027 on Amazon. This watch is around half the price of the Marathon WW194006. In order to comply with ISO 6425 certification, this automatic diving watch has a screw-down crown and a unidirectional bezel. The bezel turns anti-clockwise only and can be used to measure elapsed time spent under water. The bezel has a distinct click as it’s turned and will be slightly harder to turn when under water. This is a standard safety feature so that it doesn’t move accidentally if bumped while submerged. The Bezel triangle has photo-luminescent MaraGlo paint for viewing in low light conditions. 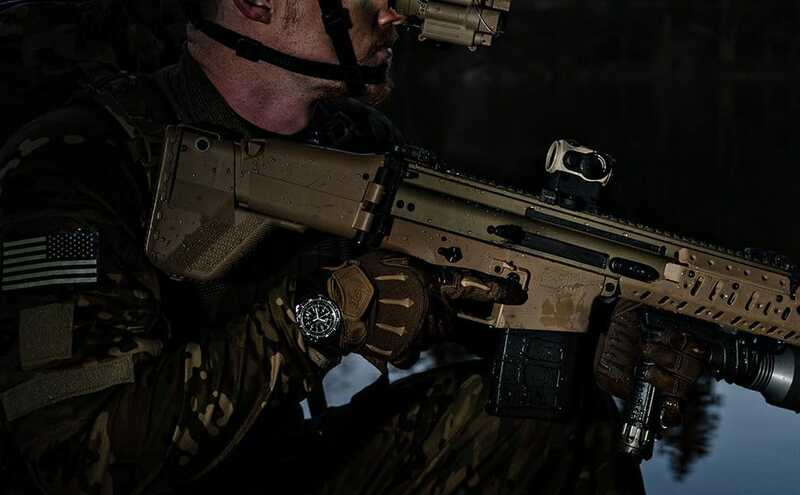 The Marathon Military GSAR uses self illuminating Tritium to provide a glow on the hour markers and hands of this watch. Tritium is an excellent light source that will glow brightly in low light conditions. It doesn’t need an external light source to create its glow. The Tritium gas is sealed in tubes. Each tube contains an isotope of hydrogen that has a life expectancy of up to 25 years. A gas tube is placed on each marker and on the hands making it easy to read the time at all hours of the night, as well as in all light conditions. This type of illumination is known as Gaseous Tritium Light Source (or GTLS). Tritium illumination in watches is not considered dangerous at all. Even in the unlikely event that the watch was dropped resulting in a vial being broken, the vial contains only a very small amount of gas which would quickly disperse into the atmosphere. As with traditional divers watches, the band of the Marathon WW194006 comes with a black rubber band and a buckle clasp. 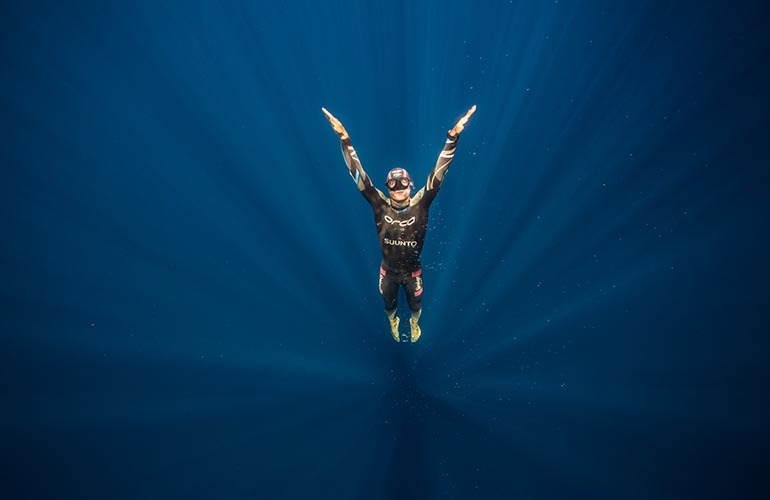 Rubber is very suited for diving, but these can be dressed up with a stainless steel bracelet. The rubber band is vulcanized, which means its undergone a chemical process to make it far more durable than regular rubber. Swapping over the band is simple if you’d prefer a stainless steel bracelet, or nato band. The lug width is 20mm. Click the button to see current pricing and any discounts that apply on the Marathon Military WW194006 GSAR at Amazon. These are very robust watches built to Military specs. They come with a 2 year Limited Warranty when you buy through authorized dealers. Amazon is an authorized dealer of Marathon watches. Once the warranty period has lapsed, look for a reliable watchmaker or jeweler to do an after-warranty clean and adjustment for you. This would only need to be done every 3 to 5 years, depending on the environment it’s exposed to. Marathon make exceptionally durable and dependable watches. The WW194006 Divers 300m Automatic is manufactured in accordance with US Government Military specifications, and is built like a tank. 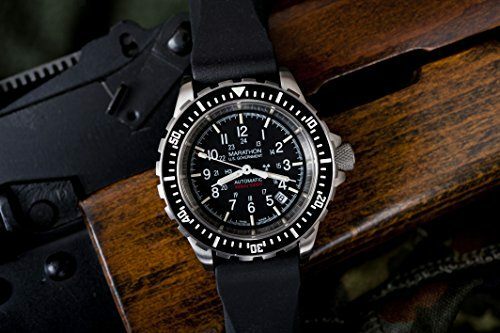 It doesn’t matter whether you’re in the military or just spend a lot of time outdoors, if you need a watch you can depend on, a military watch is the best choice. 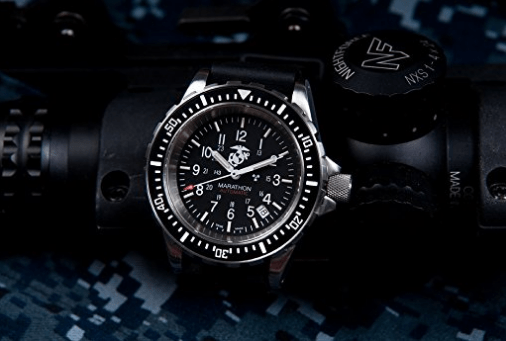 It’s a true military divers watch that’s certified to ISO 6425 and rated to 300 meters in depth. This is a tough workhorse of a watch, that really catches the eye. The Marathon GSAR Diver’s 300m Automatic combines military toughness with Swiss craftsmanship that will get the job done, and look great doing it. Hi, What a great detailed review. I’ve been looking for a tough weather proof watch as a gift. I especially appreciate your explanation of tritium, and how it makes the watch face visible in the absence of external light. It’s a great feature, but nice to know that it’s safe, and really useful too. Thank you. Good timing…I was looking for ideas for my brother’s birthday. He had a wooden Bewell before but lost it at the gym!